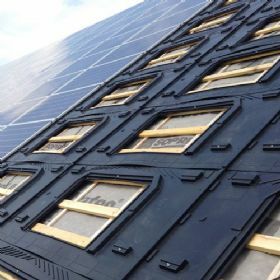 This building integrated (BIPV) Plug-In Solar kit has been specifically put together to help developers meet the Part L Building Regulations (which is aligned with the Code for Sustainable Homes) when building new houses. This kit contains all you need to complete your solar installation and meet the SAP (Standard Assessment Procedure) calculations for your new build/office/conversion or extension. All components comply fully with the G83/2 requirements and have MCS certifications. The GSE In-Roof Integration Kit can also be used for retrofits. The GSE integration kit is a simple, quick, lightweight, waterproof method of installing solar panels in-roof. It is much more inexpensive than doing on-roof installation of solar panels for new builds. Photovoltaic modules (Solar Panels) can be installed in all roof types. Integration and watertightness come from installing the steel trough with a fixing system on high point. GSE Integration allows Photovoltaic modules to be fitted to any roof cover (Roman, interlocking or flat tiles, slate or steel troughs) on new and renovated buildings. 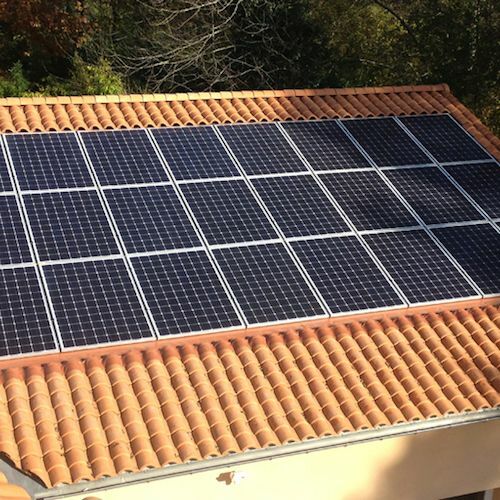 The kit can be installed in portrait or landscape format on both small installations (less than 3 kWp) and large ones (several hundred kWp). The GSE Integration system can be fitted to wooden or metal structures from 15° to 50° pitch. Depending on panel size and thickness, virtually all photovoltaic panels on the market can be installed using the GSE INTEGRATION kit. The 2.5kW (2500W) Plug-in Solar New Build / Developer In-Roof kit is supplied with 10 x MCS certified 250W MCS certified solar panels. Each solar panel has a 10 year warranty and a 25 year 80% power performance guarantee. The 2.5kW (2500W) Plug-in Solar New Build / Developer In-Roof kit is supplied with 4 x G83/2 certified Dual Micro-Inverters. The Micro-Inverter converts direct current (DC) produced by the solar panels into alternating current (AC) for use in your home. As such, it forms the heart of the DIY Plug In Solar Kit. The Dual Micro-Inverter has a 10 year manufacturer guarantee, with the option to extend to 25 years. The 2.5kW (2500W) Plug-in Solar New Build / Developer In-Roof kit comes with a simple to install GSE integrated in-roof mounting kit. These are warrantied for 10 years. Your 2.5W (2500W) Plug-In Solar Kit includes two, 3-Pole, 20AMP, Lockable Isolator AC Isolators designed for Solar Installations. Your 2.2kW (2500W) Plug-In Solar Kit includes an MCS Certified Single Phase Generation Meter. If you have any bespoke requirements for this kit, such as a different roof mounting system, or alternative layout please contact us, we will be happy to accommodate your needs. *Calculations undertaken using the JRC European Commission PV potential estimation utility: http://re.jrc.ec.europa.eu/pvgis/apps4/pvest.php and the Energy Saving Trust cost and saving facility: http://www.energysavingtrust.org.uk/domestic/solar-panels. The Solar Panels, Micro-Inverters, mounts and fixings supplied with your kit may not match those shown in the photographs but will be of an equal or better standard. Installations are undertaken at your own risk. The Installation manuals provided are to be used as a guide only, and your discretion must be used when installing the Plug In Solar product. Plug In Solar take no responsibility for incorrect installation of our product.